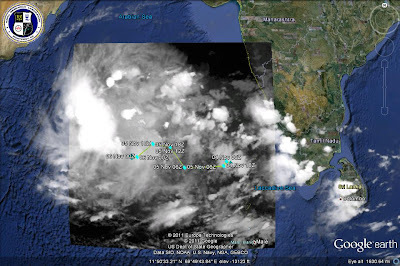 IMD has declared the system AS-3 as a depression today. It is currently located at 10N and 65E, having been almost stationary (slight SW erratic track) last 6 hrs. Core pressure however steady at 1004 mb and same wind speed at 20-25 knts. Seems to be heading for Oman, as seems difficult it will cross the 12/13N latitude. IMD also stated that -Quote" This system would not affect Indian coast." Well, our met. guys are forgetting the Lakshdweep Islands. There was heavy rain today as a result of the system with Amini Divi receiving 100 mms in 24 hrs on Sunday and Minicoy 56 mms in the same period. 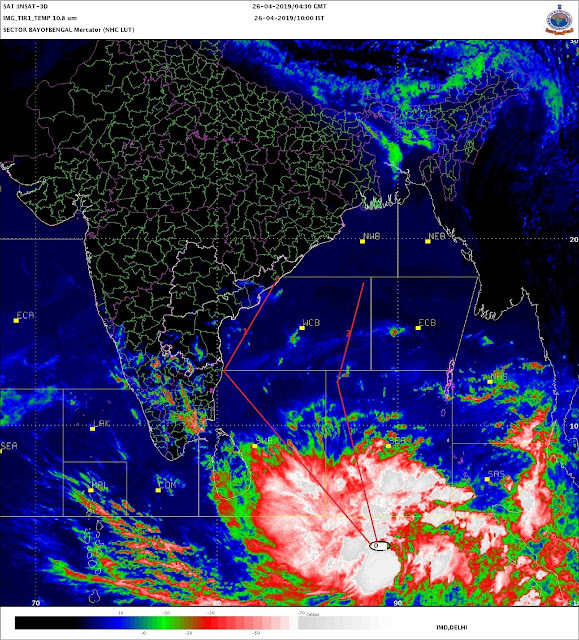 Also as mentioned in Vagaries, Kerala and Karnataka coast received some rainfall on Sunday. In Kerala, Vadakara: 205 mms, Chittur: 92 mms, Mannarkad: 80 mms, Kupaddy: 60 mms, Alathur: 59 mms and Thiruvananthpuram got 17 mms, Kozhikode got 15 mms. Naturally, lesser amounts in coastal Karnataka with Mangalore managing 11mms. S.I. Karnataka too has some rain with Agumbe getting 37 mms, and Bangalore getting 19 mms. What now ? well AS-3 seems determined to take a West path. So, decreasing rainfall in Lakshdweep and coastal Karnataka ( the sun peeped out amidst clearing clouds in Mincoy by 5.30 pm ISt Sunday. Amini Divi though was overcast all day Sunday, with a thunderstorm at 2.30 pm on Sunday) . Easterly currents will keep the precipitation on in Kerala (though reduced). Oklahoma shakes by strongest earthquake ever recorded in state on Saturday night. Bone-chilling cold brings harsh return of winter to European Russia…See International Page. Details from Our Partner Mark’s Blog. AS - 2 or AS -3 ? PWP:Thanks for pointing out my typo error. Vadakara - 20 cms !! seems isolated compared to other Kerala cities. emkay: could be a localised downpour..we see many of them here too. Had you in mind...Knew it would interest you.